Alumni authors mingle with alumni readers; books to be sold by the Stanford Bookstore; book signing. 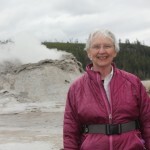 Contact author Janet Chapple to arrange a book talk or slide show of often-missed wonderful features in Yellowstone National Park. 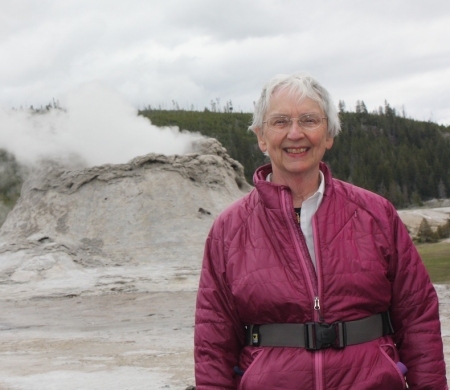 Janet and/or her colleague Suzanne Cane also give talks about Yellowstone, Land of Wonders (University of Nebraska Press, 2013). For biographical and book information and author pictures, see our media kit. Presentation: “A Love Affair with Yellowstone National Park,” with samples of art from Through Early Yellowstone. Fans met the author and attended the book signing. Stanford hosted a light lunch and a presentation called “A Love Affair with Yellowstone National Park.” After giving some background about herself, Janet Chapple read excerpts from Through Early Yellowstone and showed several unique watercolors by Thomas H. Thomas from the book. Janet read some favorite excerpts from Through Early Yellowstone, showed images from it, and also talked about acquiring the Thomas paintings for its centerpiece, with a little about herself and her other books. Janet Chapple talked about the park and her three books, and showed some of her beautiful photos. From IBPA’s “Independent Publishing Now” e-newsletter of September 24, 2013: “Suzanne Cane and Janet Chapple enjoyed lots of sales while camped outside the Old Faithful Inn in Yellowstone National Park earlier this summer to promote their titles, Yellowstone, Land of Wonders, and [the fourth edition of] Yellowstone Treasures. While discussing their books in front of the indicator clock that shows passersby the prediction time for the next eruption of Old Faithful Geyser (many of whom wanted to know more than “when is the next eruption” and “where is the bathroom”), they gave away a bonus 2010 Yellowstone quarter (part of the national parks series) to each buyer.” Yellowstone, Land of Wonders is available from University of Nebraska Press.